The Sunderland Echo has printed its final "Pink" football special bringing an end to 106 years of history. 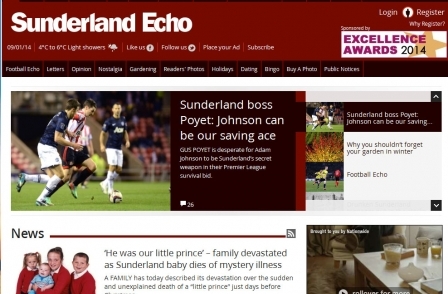 Echo sports editor Neil Watson said financial and logistic reasons were behind the move. Watson said when the paper's printing press closed and print moved to Dinnington, Sheffield, the Football Echo had to be printed overnight and delivered to the North East on Sunday morning – rather than Saturday afternoon. The final edition of the "Pink" was printed on 28 December, 2013. He said that with matches being played outside the traditional 3pm Saturday timeframe, the justification for a football special had waned. The Football Echo had an average weekly circulation of 3,865 in the first six months of 2013. Watson said: “Being online means it is more instantly accessible for our readers, they get the information quicker." The Football Echo or “Pink” was first published in 1907. Sunderland Echo editor John Szymanski said the Pink "has followed the fortunes of Sunderland AFC through many highs and lows. The Football Echo is now made available on Saturday evenings as a free page-turning digital edition.